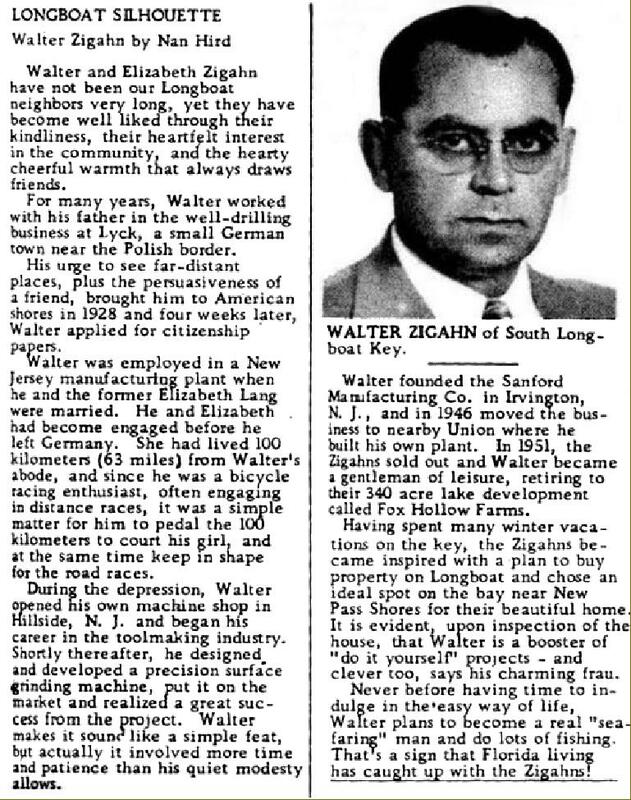 Walter Zigahn and the Sanford Grinder Mfg. Co.
As befits the small dimensions of the Sanford SG surface grinder, the company also started in a very small way: Walter Zigahn was a German immigrant who settled in Hillside, New Jersey and, during the depression, he opened a small machine shop. RCA had a need for a miniature surface grinder to facilitate making the small dies for their filaments. A machinist who worked there came up with a basic design and showed it to Zigahn. As the story has been passed down within the Sanford company, Walter replied, "Come on over to my garage!" Where exactly this garage was is a bit of speculation. Zigahn was listed as having a machine shop in the rear of 4 Nelson Place in Irvington from 1936 to 1940. This seems likely to have been the garage he referred to. The design for the grinder was a ¾ scale version of the widely used 6" x 12" surface grinder. After developing and refining the machine, Zigahn decided to manufacture it. No simple decision, this required the production of all the patterns from which molds could be made, lining up foundries who could produce cast iron parts in fairly small numbers, obtaining OEM suppliers for motors, belts, gears and bearings, and assuring that the proper tools like lathes, milling machines, planers and grinders were available to support production. A skilled work staff was needed to machine, assemble and certify the precision grinders - and so the Sanford Manufacturing Company was founded to produce his grinder. Not one to embellish words, he called it simply - the Model SG (small grinder..). Beginning life in 1941, the Sanford Manufacturing Company was based at 1281 Springfield Avenue, Irvington, NJ. in a small 2-story structure at the rear of a 50' wide lot with a narrow, 3-floor apartment building at the street. Zigahn took the company name from the area in which it was founded - they were right at the intersection of Sanford Ave and one building over from the Sanford Theater with its glittering "SANFORD" in bright yellow lights with an orange border. This first company was never incorporated - as Jon Meadow puts it, "It was all Walter Zigahn". That original building still barely stands in 2017, nothing but the crumbling walls remain and it will not last long. By 1946 the company had outgrown its small premises and Zigahn built a 10,000 sq. ft. factory at 1020 Commerce Ave. in nearby Union, NJ. It was during this time that Zigahn added the larger Model MG grinder to the line at a customer's suggestion. The old Irvington building was used by the Sano Company to produce pickups and amplifiers for musical instruments until the 1970s. New York attorneys M. Michael Meadow and his brother Saul had been constructing and selling neat little bungalow houses. Tom Moore, a civil engineer who was the building inspector for Union, NJ was their construction supervisor. They eventually sold over 600 homes. These were FHA approved homes geared towards veterans who could purchase a home for $275 down and $58 a month. They needed a legal address in New Jersey for their building permits. Tom Moore knew Walter Zigahn from the Union Lion's Club and arranged to rent desk space at 1020 Commerce Ave. Apparently they were impressed with the company, and when Zigahn expressed a desire to retire, the Meadow Group bought the business from him. The company was incorporated in 1951 with M. Michael Meadow as the president according to documents from the State of New Jersey. Saul was bought out and retired to California in the early 1950s, and Tom Moore retired to Longboat Key in Florida in 1957. Walter Zigahn, who had built a retirement house at Fox Hollow Farms in Sussex County, NJ, soon followed the Moores and built a home next door on the key. He passed away in 1961, only 58 years old. Through 1958 the company was quite busy, working 2 shifts and Saturday. In addition to the Sanford surface grinders, they produced the DoAll 612 grinder for that company, and started a division called Micromech, making grinders for more specialized purposes. Many of the Micromech parts were stainless and these grinders were referred to as wafering machines and used to cut hard metals and exotic materials wafer thin. Within the industry they were known as 'slicing and dicing' equipment. Micromech was one the first in the field of specialty machines for slicing semiconductors. Its initial design was developed by Shockley of Bell Laboratories who approached Sanford about making the table "travel electrically" - the initial prototype had a Graham drive. The products were sliced with diamond wheels and were silicon and germanium crystals, glass, quartz, garnet and many other exotic materials. Labs used Micromech equipment to analyse field failures of aircraft engines and the Canadian Department of Fisheries and Oceans used Micromech machinery to cut the teeth of sharks to determine their age. Sanford also produced a 'ring grinder' for the oil and auto industry to grind piston rings with carbide burrs, did stamping for other companies including the filaments for fluorescent lights and, as a consequence, had outgrown the 10,000 sq. ft. building. In 1959, Mr. Meadow built a new 15,000 sq. ft. plant at 695 Rahway Ave in Union. The company was at their peak at this facility, with as many as 35 employees turning out the redesigned SG-48 grinder (introduced in 1961) and other products. Jon Meadow stated they sold worldwide by this point. "Virtually every tire plant had Sanford grinders in place… A lot of hands were involved in the manufacturing of Sanford surface grinders and Micromech semi-conductor wafering machines and few people who used the end product realized what went into its manufacture. The amazing part was the range of customers from the small tool makers, hobbyists, to the gun makers like Smith & Wesson and Sturm-Ruger to the industrial giants like many divisions of General Electric to automotive like General Motors to aerospace like Boeing, Lockheed-Martin, Pratt & Whitney." According to Jon Meadow: "My father sold 695 Rahway Ave. in 1971 and they retrenched to a 4,200 sq. ft. rental in Rahway at 1410 Pinewood St…The street wasn't even paved…The crew went down to eight and the facility was too small and inefficient". In 1972 Jon Meadow had gotten involved with the company and his father M. Michael Meadow passed away in July, 1978. "In January of 1979, I moved the company to a 6,500 sq. ft. facility in Roselle at 300 Cox St. where we stayed for the next fifteen years. After our lease expired, we leased at 241 E. Highland Parkway in Roselle but our major manufacturing days were over." Sanford had their iron castings produced by several foundries including Reading Foundry in Reading, PA, American Brake Shoe in Ramsey, NJ, and the North Jersey Foundry. Foundries contracted for the aluminum castings were August Spindler & Sons in Kenilworth, Spindler Bros. in Cranford and Nation Bronze & Aluminum in Irvington. However, machined parts such as the spindle and leadscrews (and their nuts) were machined in-house.. In addition to selling through machinery dealers the grinders were offered by the Brodhead-Garrett Co, who supplied tools for high school workshops. But small companies found it tough going in the latter part of the 1970s. Manufacturers merged and streamlined production. They wanted to sell thousands of pieces, not 50 or 100. Small companies were told to buy from distributors instead of the factory directly. Stock from the distribution centers might be old. In the case of Gates Rubber, who supplied the critical drive belts, order lead times reached nearly a year. The prices for Sanford grinders increased and market share fell. "The final demise of the small American machine tool builder came when we, (America), stopped manufacturing here. We were our own best customers "- Jon Meadow. Today, the patterns and molds are in storage and there are no plans to produce machines or parts. A side note: An earlier company, the F.C. Sanford Manufacturing Co in Bridgeport, CT, made centerless grinders in the 1920s, but was not related. This older company was owned by Francis C. Sanford who passed away in 1992.